The AutoTrains pane allows the dispatcher to take control of an Auto Active Train (an automatically running Active Train) from the virtual dispatcher when required to solve a problem, and to restore automatic operation after the problem is solved. Example problems requiring the dispatcher to intervene are derailment of the train, or unexpected uncoupling of cars in a train. This window is also used to restart automatic operation after suspending it for a human engineer to switch train cars or perform other work. When the first Auto Active Train is created in Dispatcher, an AutoTrains pane is opened immediately to the right of the Dispatcher window. The pane may be moved to another location if desired. An entry is added for each additional Auto Active Train as it is created. When an Auto Active Train is terminated, its entry is removed from the AutoTrains pane. Below is an AutoTrains pane showing two Auto Active Trains, Amtrak 139 and GTW 6418. Entries are separated by a horizontal line. Each entry has a Stop button and a To Manual button. If the dispatcher presses the Stop button, the Auto Active Train is immediately stopped. The stopping is an emergency stop--no gradual reduction of speed. 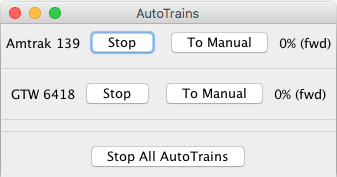 Clicking the Stop All AutoTrains button at the bottom of the pane will issue an emergency stop to all Auto Active Trains shown in the AutoTrains pane. Stop buttons change to Resume buttons when trains are stopped. Each stopped train must be restarted individually by clicking its Resume button. Once an AutoTrain has completed its run, the Stop button changes to Restart. Pressing this causes the AutoTrain to begin running again. The Fw (Forward) and Rev (Reverse) radio buttons control the train direction and the slider controls the train speed. The dispatcher can use these controls to run the train and fix whatever problem is present. When the problem is remedied, clicking the To Auto button will restore automatic operation of the train. Note: Prior to clicking its To Auto button, the dispatcher should run the train to the same location where it was when To Manual was clicked. This assures smooth resumption of automatic operation. One of the user-selectable Transit Actions is Go to Manual Mode. This Action supports running an Auto Active Train automatically to a work site, where a human engineer takes over to perform operations (perhaps switching cars), after which automatic running is continued following the same Transit. When the Go to Manual Mode action is initiated, the Stop and To Manual buttons are replaced by one Resume Auto Running button, and the computer throttle being used by the virtual engineer is released. A human engineer can then plug in a manual throttle and acquire the train for manual running. After the human engineer has completed his/her work, the human engineer releases the manual throttle, and informs the dispatcher that automatic operation may be resumed. The dispatcher resumes automatic operation by clicking the Resume Auto Running button. Prior to releasing the manual throttle, the human engineer should run the train to the same position it was in when manual mode operation was initiated. This ensures smooth resumption of automatic operation.